Join the email list and receive this guided healing session for FREE. 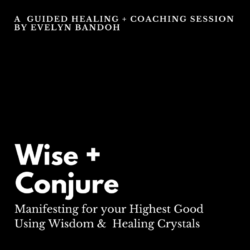 Mystic Genius Podcast along with with this website were both created and are maintained by Evelyn Bandoh as labor of love and service. As you can see, there are no paid advertisements on this site and my goal is to keep it that way. If you've been helped in anyway by the information shared on this website, please consider making a contribution via PayPal: http://paypal.me/MysticGenius Thank You!